Power on: Turn on the power Key, the green LED indicator flashes 2 times. The controller is powered on. Power off: Turn off the power key. The controller is powered off. Pairing: Long Press Logo for 3 seconds, the blue LED flashes fast. The controller will enter pairing mode. Standby: The controller will enter "standby" when you long press Logo Key or leave the controller unused for a while. Click Logo key to wake up. After it is waken up, the blue LED will slowly flash and the controller will automatically connect to paired devices. Then the blue LED will stay on. Charging: WEE has a built-in lithium battery. Slow flashing green LED indicates low of battery. Please charge with the USB cable. Red LED is on when charging and goes off when charging completed. Long press LOGO key to enter pairing mode (Blue LED fast flashes), turn on bluetooth on your device and search for FeiZhiWee. The device and the controller start to pair. Blue LED stays on when pairing accomplishes. Compatible with Android;Support Android 4.4 above System; NOTE: This game controller doesn't Compatible with IOS !!! 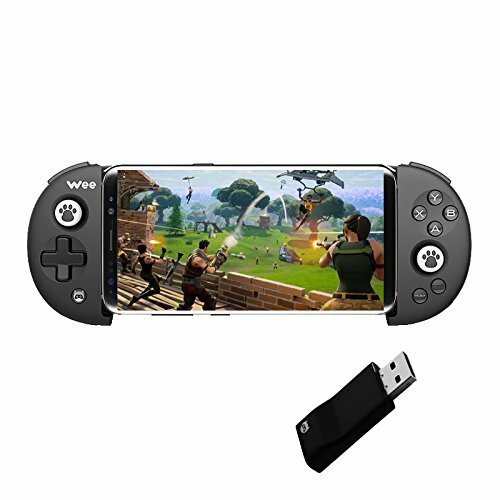 Supports vast majority of big games and simulator games.The game controller adapter（USB-sized） that comes with the gamepad is suitable for Android Mode,no need Root,no need PC.Hot swapping. Auto-register controllers. Optimal button mapping.And it's easy for you to play original mobile games. With telescopic stand, mobile phones can be placed in the bracket (support 3.5-6.3 inch devices and support thickness within 0.36inch). Complete with a friendly user-interface, you do not need to install any drivers to start using it. Bluetooth 4.0 wireless transmission can support 10 meters wide range of control from the operation. If you have any questions about this product by Bounabay, contact us by completing and submitting the form below. If you are looking for a specif part number, please include it with your message.